When an impoverished, God-fearing family of eight takes up residence with a chronic gambler, his boozy wife and their three offspring, the stage is set for a fair dinkum Aussie epic. And the long awaited screen adaptation of Tim Winton’s cherished 1991 novel ‘Cloudstreet’ delivers. The ”major mini-series” premiered last Sunday night and while some of the establishing scenes were a bit labored, it picks up speed over the next two episodes to eventually romp home with a tear-jerking, cracker jack finale. 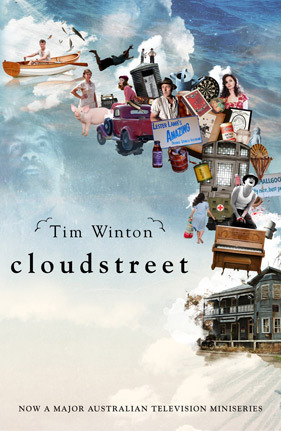 Winton’s ‘Cloudstreet’ was recently voted the ‘Most Popular Australian Novel’ by the Australian Society of Authors so there were great expectations for this Showtime production. In 1998 the book was adapted for the stage and the four and a half hour play was a huge hit, touring the world to great acclaim (my sister Tess created the costumes for that legendary production directed by the masterful theatre magician Neil Armfield). Film versions have been mooted over the years but it comes to the screen now in an extended six hour series with a stellar cast that breaths fresh life into the story about how two polar opposites finally find harmony and purge a haunted house of its ghosts. It all begins in 1943 when tragedy strikes the two families. Sam Pickles (played by Stephen Curry) looses his fingers in a work accident, while Fish Lamb (Callan McAuliffe, and later a terrific Hugo Johnstone-Burt) suffers brain damage after nearly drowning. Both events draw the two families to Perth where the Lamb’s become tenants in the Pickles’ inherited house at Number 1 Cloudstreet. In order to maintain some sense of privacy, Sam divides the backyard with a makeshift fence. And it soon becomes apparent in the fertile garden that they create that the industrious Lamb’s, headed up by Lester (an adorable Geoff Morrell) and Oriel (a fearsome Kerry Fox) are determined to make a go of it. The Pickles, as their name suggests, are too busy getting drunk and loosing all their money at two-up to nurture anything…except, by default, a beautiful daughter named Rose (Emma Booth). But something isn’t right with the house itself. It creaks and groans like an old container ship and the kids, especially Fish, can feel its pain. A mysterious indigenous local named Bob Crab (Kelton Pell) also senses the unease and waits for the day when he can finally release the troubled spirits of the three aboriginal girls that are trapped inside. Of course there’s an awful lot of water that has to be navigated before that can happen. Sam’s wayward wife Dolly (wonderfully realised by Essie Davies) has to reveal her true origins in order to heal the rift with her daughter, and the prodigal son Quick Lamb (Home and Away’s Todd Lasance) has to miraculously survive a near death experience to realise that this ramshackle old home is, despite all its faults, where his heart truly is. This sweeping nostalgic domestic epic is directed by Mathhew Saville, the man behind the feature film Noise and the telemovie The King (which also starred Stephen Curry). Tim Winton himself was onboard as co-writer with Ellen Fontana, ensuring that the essence of the book was dutifully carried across. Production Designer Herbert Pinter (whose work includes classics like Breaker Morant, Picnic at Hanging Rock and Gallipoli) created the sometimes magic realist visual world on the banks of the Swan River where the old Sunset Hospital used to be, and cinematographer Mark Wareham made it all look totally lush on High Definition Video. The series stretches across two decades in three parts, taking us through the ups and downs of the two families lives in what sometimes feels like a maelstrom of chaos until order is finally restored. Bookended by a bucolic scene of the two families luxuriating by the Swan River, a place that flows with the life force itself and into which Fish must once again swim, the series (like the book and the play) is ultimately a life affirming testament to the trials and tribulations of working class family life. In the end there’s even a sense that Cloudstreet, which by its name suggests is a place both up in the sky and down in the gutter, might be something pretty close to heaven right here on Earth.